Cabin Bed Bonny BOHS80 decorative (front) Colour: Silver Grey Features: - Ornament # 09 coated particle board. - Colour (body): White. - Sturdy construction and quality finish. , with three lying surfaces. - Extendable Desktop under the base with divider sections for books or stationery. 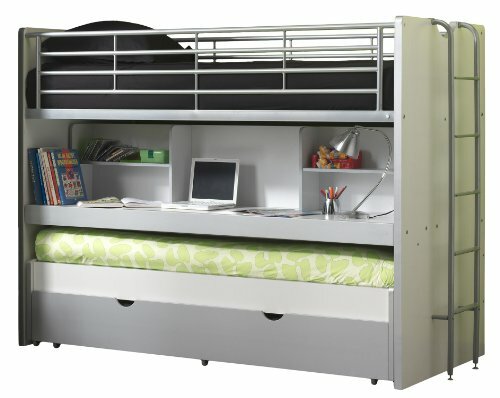 - Adjustable Drawer can be used as a third provide an extra bed storage. Colour: White. Material: Wood. Frame Material: Wood. Number of beinhalteten products: 1) sleeping area: 90 x 200 cm Target group: - For Boys And For Girls. Theme:, neutral. Style: 100% Brand New. Storage space: Yes. Guard: Yes. Conductor: Yes. Bed Type:/playing/Children's beds single beds. Dimensions: - Dimensions (bed drawers): 90 cm W x 190 cm D. - Total height from top to bottom: -3.5 161 cm. Total width from left to right: "-40 cm. Total Depth from front to rear: 212 cm. Total weight: 196 kg. Assembly: Assembly required: Yes.